Usually, I hate the word haul. As a verb, by definition it means to pull or drag with effort or force. Coupled with the synonyms heave, manhandle and tug, it implicates shopping with hard work, toil and labour. If that’s true, I’d argue it’s a labour of love. However, there seems no other fitting word to describe the purchases I made during Wednesday’s thrifting trip. As you know, Wednesday marked my first day as a free woman following the 100 Day Spending Ban. Having gone cold turkey for so long, I worried that my new-found freedom would cause me to make frivolous purchases, purchases that I wanted but didn’t need. 1. I really missed having a good old charity shop rummage. 2. I’m helping support many different charities, even if it’s only a small contribution. 3. I like the idea fantasy that by thrifting some items I’m creating a unique wardrobe. >4. Yet again, it’s a tight month. I’m pretty broke. 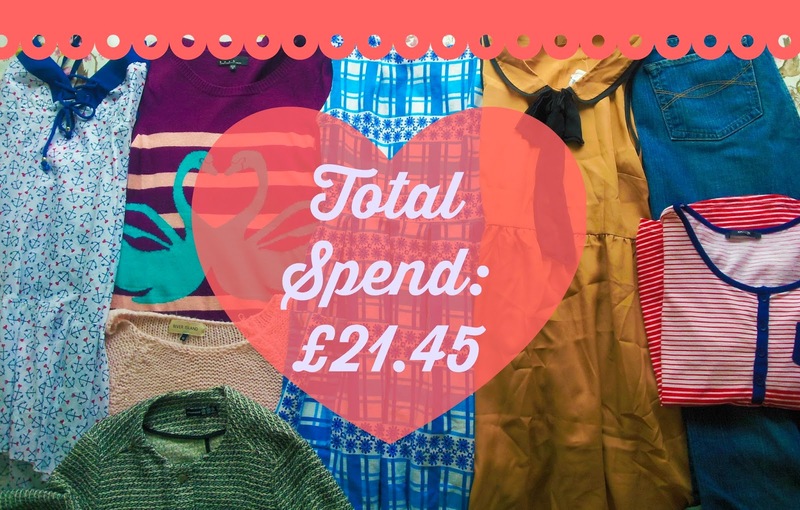 Did you see Rachel had managed to save £130 during the spending ban by putting away a little each day? Unexpected bills swallowed my usual clothes budget, but I did manage to save some pennies… £25’s worth of loose change to be exact. Shortly before the end of the spending ban, I went window shopping in Liverpool. I tried on so many pairs of jeans, but none fit. The brief? 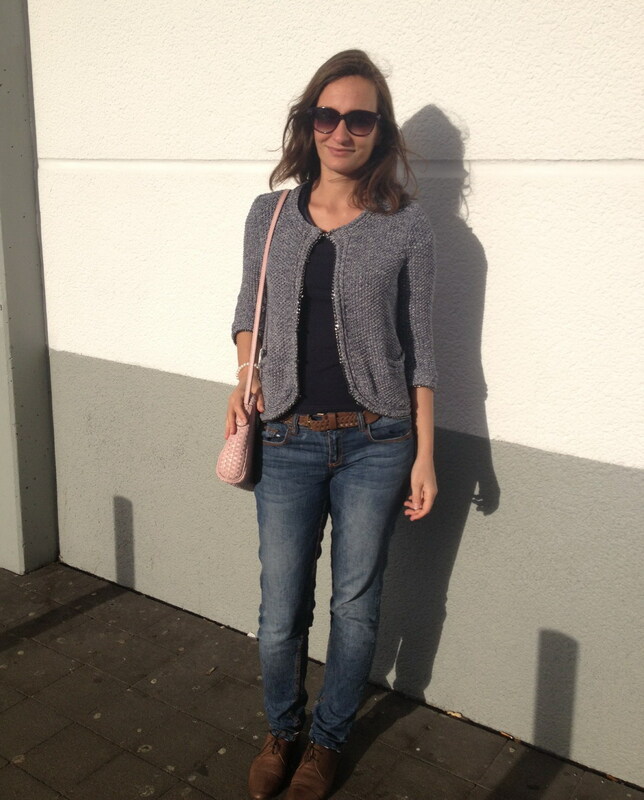 Loose fitting, non skin tight jeans in a medium wash. Boyfriend jeans. Being a curvy girl, this aint no easy combination to find. Can you believe my luck when I found these Abercrombie & Fitch jeans? They’re exactly what I wanted and fit so well. Since Wednesday, I can’t shake this LFO song from my head: ‘You looked like a girl from Abercrombie and Fitch’. Enjoy, you can hate me later. 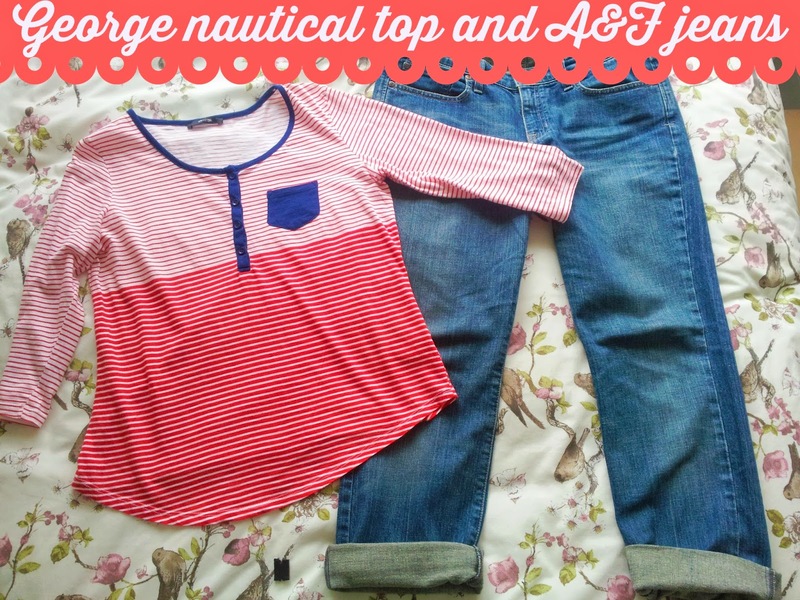 Even though nautical is right on trend right now, you know I’ve always enjoyed a nautical love affair. This cotton top will fit right into my wardrobe and will be a good basic to pack when I travel across central Europe in summer. 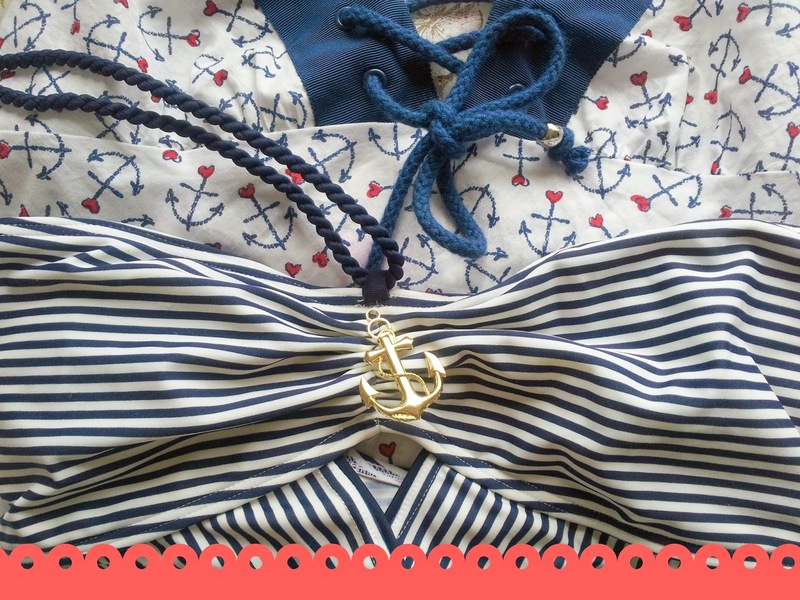 Continuing the nautical theme, I picked up this Floozie by Frost-French cover up for £3.49. It’s in immaculate condition and will be perfect when I visit Lake Bled during summer adventures with the boy. It perfectly matches the stripey one-piece that I plan to take with me. Can you believe I found an Urban Outfitters dress complete with tags for £2? 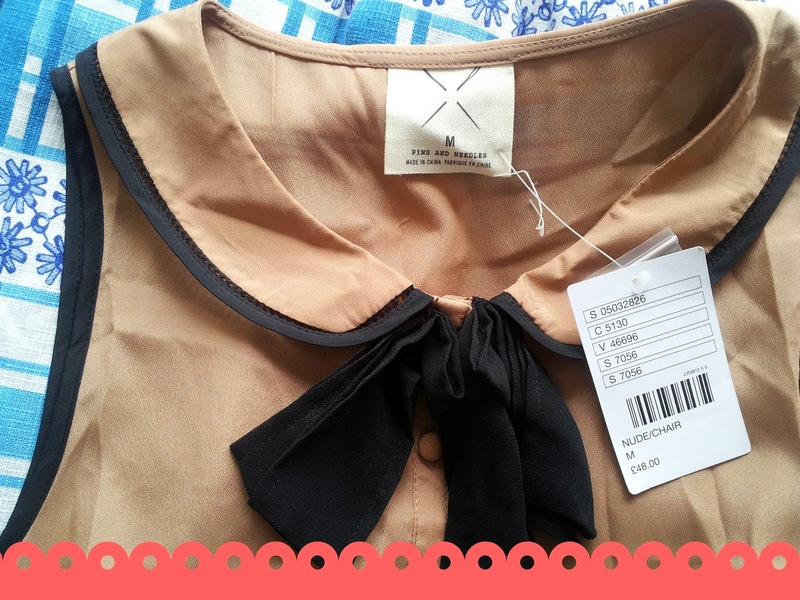 What’s more, can you believe this dress had a Peter Pan collar too? The dress is from their Pins and Needles brand, a brand that I’ve purchased before. I can just imagine this with mustard tights for winter, or bare legs in summer. Score! 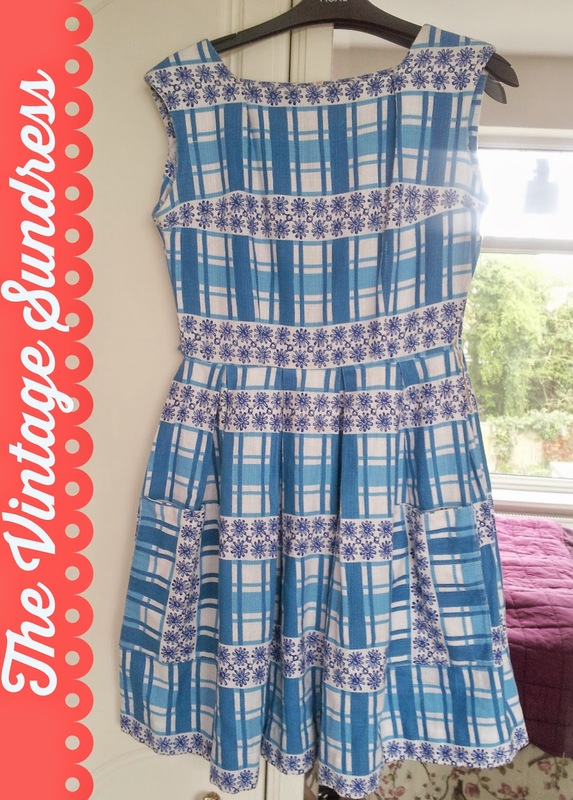 Can we take a moment to admire just how pretty this vintage sundress is? My heart leapt when my friend pulled it from the rack for my consideration. Instantly, I decided it was coming home with me. 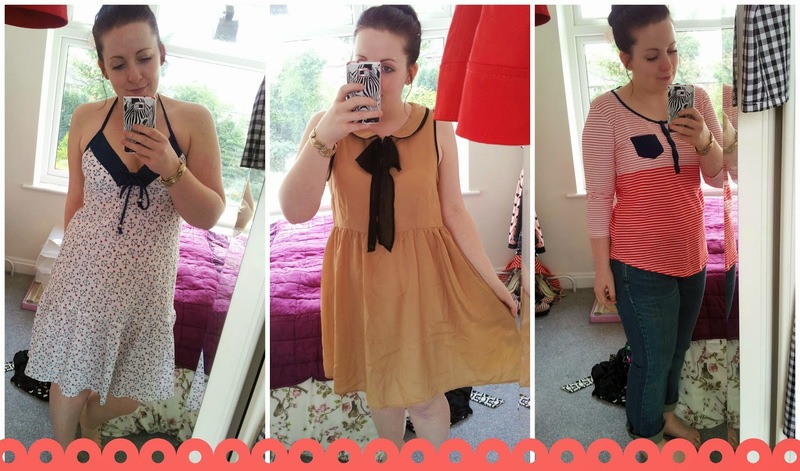 I didn’t care what size it was, dresses are made to be altered! It’s no surprise that it doesn’t fit me, it’s about a size 8. I can barely get it over my head. I’m hoping and praying that something, anything, can be done. With summer on the horizon, I guess buying jumpers wasn’t my best idea. 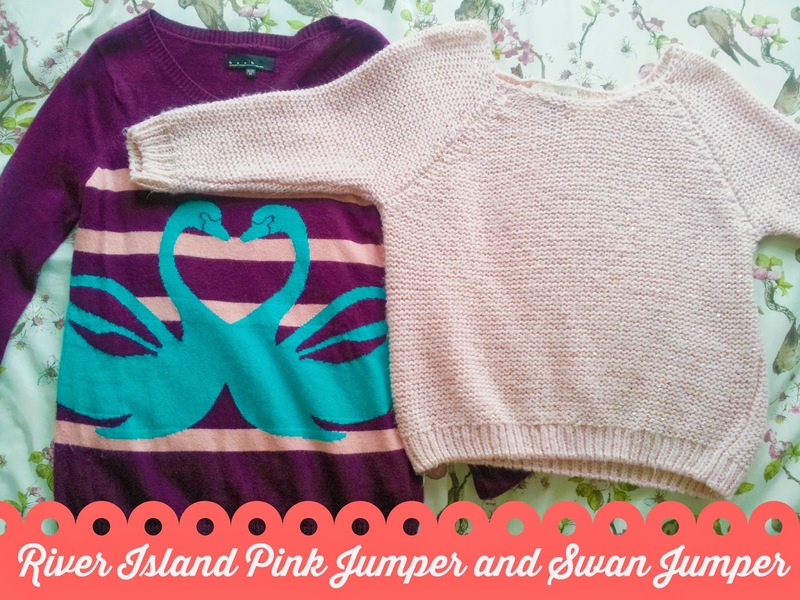 However, I loved the quirky colours of the swan jumper and thought it’d be a piece to put away for autumn. 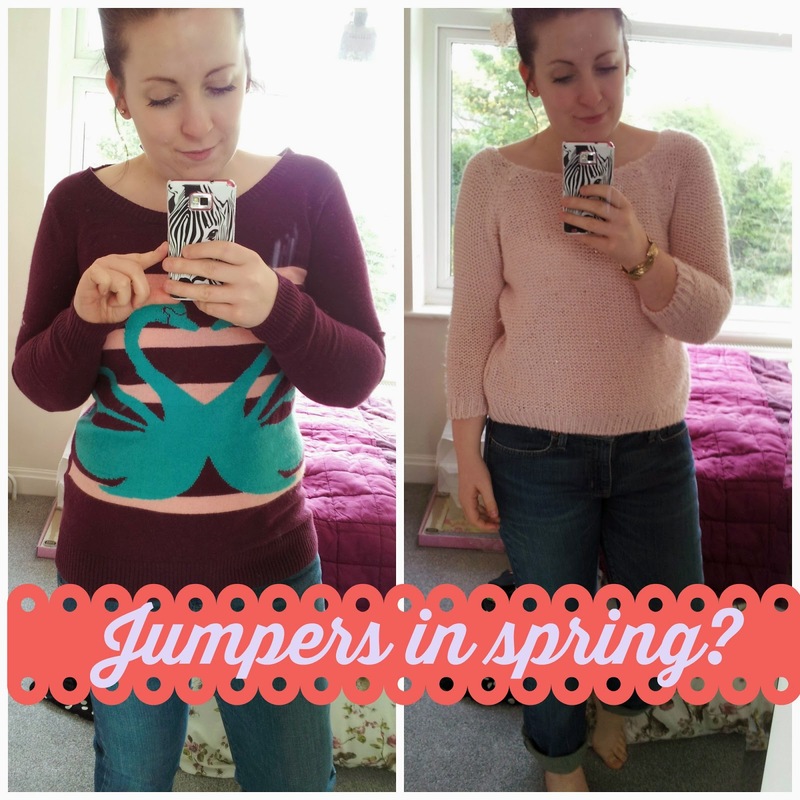 The River Island jumper also seemed like another great basic, what’s more…IT’S PASTEL PINK! I’ve been hankering after more pastel colours in my wardrobe this spring. The shade makes it a good alternative to a jacket on warmer days. I wasn’t entirely sold by this jacket at first. It all felt a little Jackie Onassis. However, a little internet style searching made me rethink the classic Chanel Boucle jacket. I plant to style it like this for a casual look. 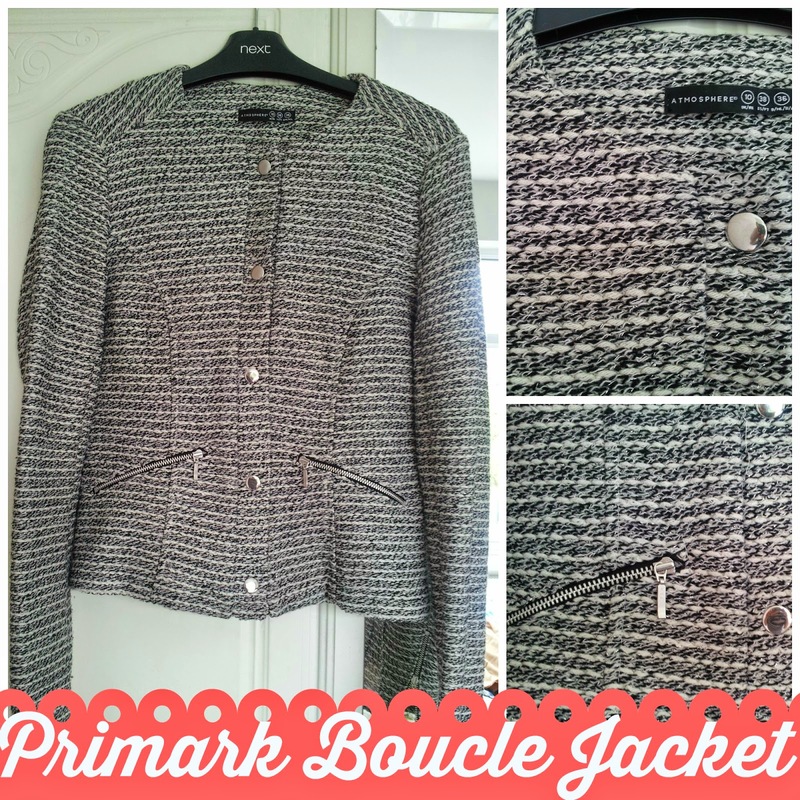 Granted, I doubt the boucle featured in the link is a thrifted Primark jacket, but I think it could work all the same. At £2.99, it’s cheap versus steep. My itch to thrift has well and truly been scratched, with change to spare! I’m already imagining all the outfits I can create with my new purchases. 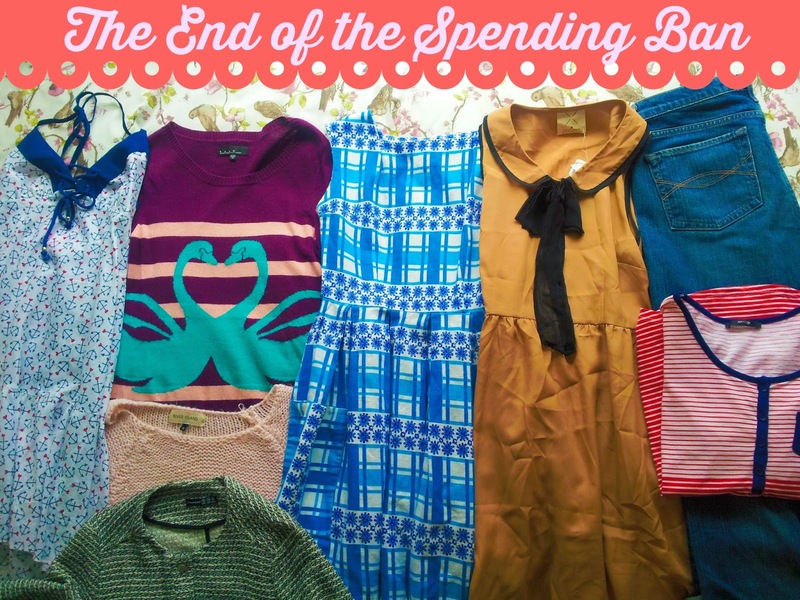 Have you thrifted any bargains recently?